Author Adam Lance Garcia calls the Green Lama “the world’s first Buddhist hero.” And that’s true, we suppose. Certainly he predates Judomaster, the Question, Iron Fist, and the Teenage Mutant Ninja Turtles. And we can’t find any evidence confirming Siddhartha Gautama’s ability to leap tall temples and run faster than a snow leopard. So, yes, the Green Lama was the first Buddhist superhero. Gold star for him. He made his prose fiction debut more than 70 years ago, and he starred in a total of 14 adventures from 1940 to 1943. He was never as iconic or popular as Zorro, the Shadow, Doc Savage, or Buck Rogers. But his ongoing appeal is evident by a recent slew of lively adventures written by Garcia (check out our review of The Green Lama: Unbound). The most recent of these adventures, The Green Lama: Scions, is a reverent and fun novel-length refresh of the viridescent vigilante. All together now: Om! Ma-ni Pad-me Hum! Hail the Jewel of the Lotus Flower! But Dumont was a complicated man. Reinventing himself as a superhero in a hooded green robe, he was compulsively driven forward by a faith he constantly betrayed. Despite the talents he possessed (strength, magic, trickery), he felt like he was merely dabbling with the powers of gods. He had chosen the path of the Bodhisattva, but he didn’t let the tenets of his faith stop him from punishing mobsters and monsters. 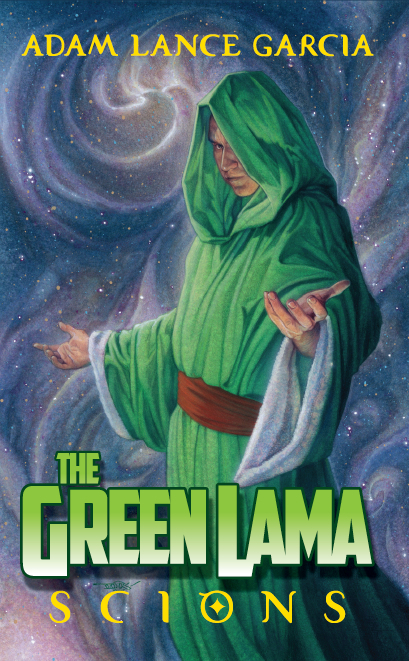 All this philosophical conflict makes the Green Lama sound like a super serious character. And we must admit that he is a tad earnest (although he can be pretty good with a zinger every once in awhile). Thank goodness he surrounds himself with a bunch of nutty associates who lighten the mood considerably. At the top of his list are Jean Farrell and Ken Clayton, two people with a flair for witty repartee. 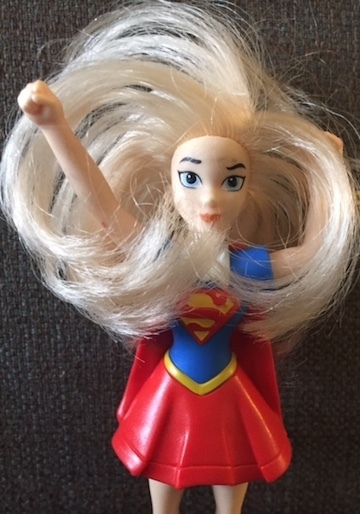 Then there’s Betty Dale, an aggressive Lois Lane-like newshound who will stop at nothing to solve the mysteries surrounding Dumont. Other members of Team Green include Tsarong, our hero’s spiritual counselor, Lieutenant John Caraway, Gary Brown, Evangl Stewart-Brown, and a mysterious woman named Magga. By now we all know that the criminals of New York City are no match for the Battlin’ Buddhist. But every superhero needs backup, and the Green Lama’s eccentric crew is second to none. This entry was posted in New/Old Pulp, Published in 2014 and tagged Adam Lance Garcia, Scions, The Green Lama. Bookmark the permalink.